webOS as it stands today is lacking in many areas. Some are important, others not so, though that's really a judgement call for each user, though that's a judgement call that needs to be made with every OS, even our most beloved one. Many platforms support sharing of media over a local network or to a properly-equipped TV set, however webOS has never supported any such feature. Until now. In swoops Zap Photoshare by small indie developer Hominid Software. The app doesn't add any significant features to webOS like DLNA streaming, however it does do many very neat things we've never really seen on webOS. For all intents and purposes, Zap Photoshare is a local network photo sharing app. We imagine the developer could add in support for video and audio playback but the app does specifically have the word photo in its name, so it's not like the app is actually missing any functionality. It's meant to share your photos across your networked devices, and that it does do. The initial setup of the app is pretty simple; you must first authorize it to access your photos, at which point an HTTP server is set up on your webOS smartphone or TouchPad to allow the viewing of your photos. You can change which of your photo-containing folders is shared at any given time by way of a drop-down menu in the header. When the background service starts up to provide the sharing capability, you're presented with some basic information to let you know what all is being shared, where it's being shared, and how to access it. Sharing with Zap Photoshare is really simple. The most capable and widely available option is to open up your web browser on your computer, TV, game console, phone, or tablet and navigate to the URL shown. If you happen to own another webOS device that has Touch-to-Share technology built in, you merely tap them together, connect them via Bluetooth, and webOS will take care of the rest. 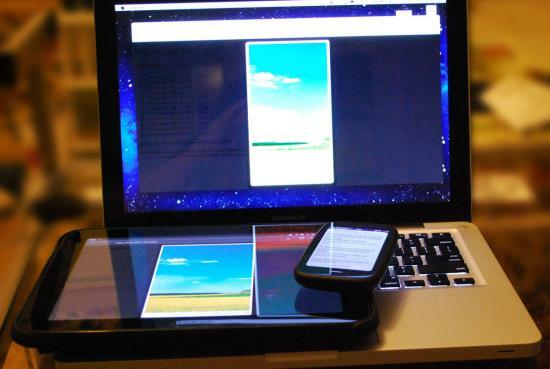 This can be achieved between two TouchPad tablets, a Pre3 and a TouchPad or two Pre3 phones. Once you've opened the URL in your browser, you're presented with a simple UI containing all of your photographs and a sleek photo viewer. What's missing, however, is a simple way to download the pictures without using the context menu. On webOS, it is particularly painful as it requires you to open the picture in a new card so you can save it, then toss away the new card and get back to the gallery page. One minor annoyance is that upon opening up the website you're immediately shown the most recent picture, requiring you to close the box in order to see the listing of pictures. It would also be nicer if perhaps one could view thumbnails of the photographs rather than text links with the file name. I'm not necessarily going to know what the name of the picture I took last week was, while I would likely recognize it if I saw it - and so would friends and family if I were to show them. 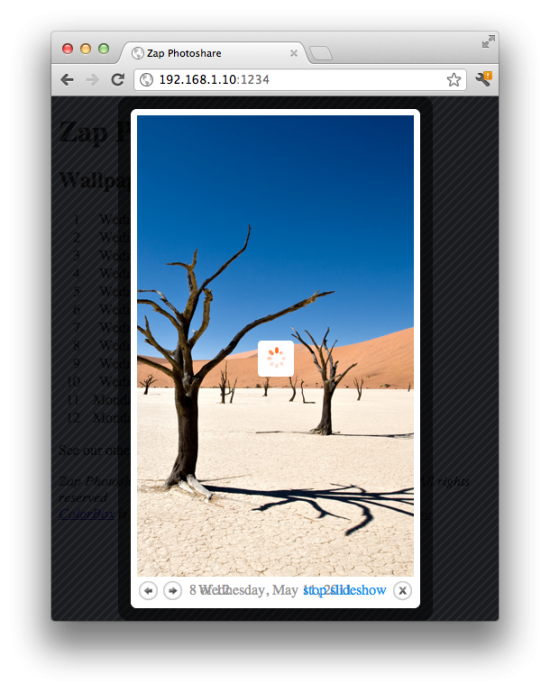 Zap Photoshare fills a niche for webOS and does so very well. It brings in the ability to share your photos over your WiFi connection, it's the first app in the App Catalog to use Touch-to-Share technology, and it does so in a relatively simple manner that accessible to more than just specially-equipped devices. It's also the only app available for webOS that accomplishes this task, and at $1.99 it does so at a reasonable price.